I chose to use only carnations for the design, with a clear vase as the base, a bit of green filler for textural interest and a “liz” touch with hot peppers sprinkled throughout the flowers. 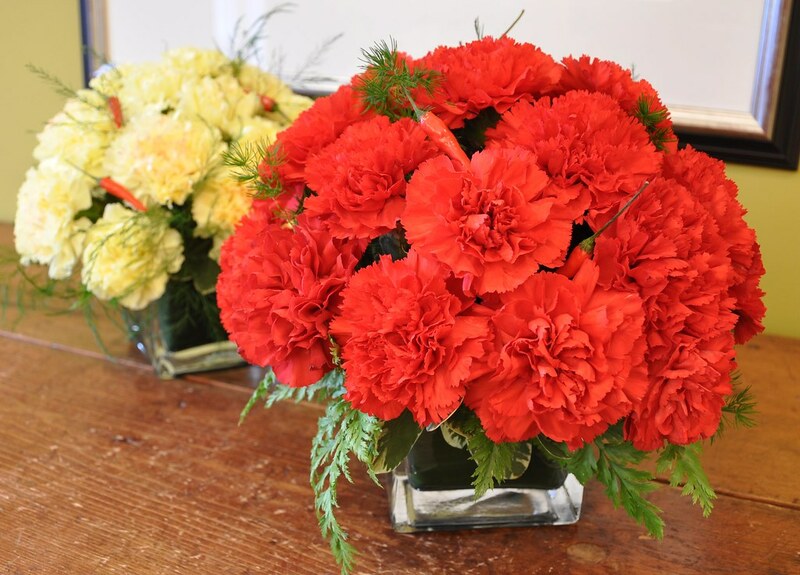 The shape of the arrangement was kept very simple and I used 30 stems of one colour of carnation for each arrangement – red or yellow, the national colours of Spain. I loved the results and even my sceptical friends who wondered at anyone’s ability to turn 900 stems of yellow and red carnations into an inspired floral design, were impressed with the outcome. This entry was posted in Floral Arrangement, Floral Design, November, Uncategorized and tagged carnation, Floral Arrangement, floral arrangements, floral design, Flowers, hot peppers, red carnations, spain. Bookmark the permalink. Both comments and trackbacks are currently closed.